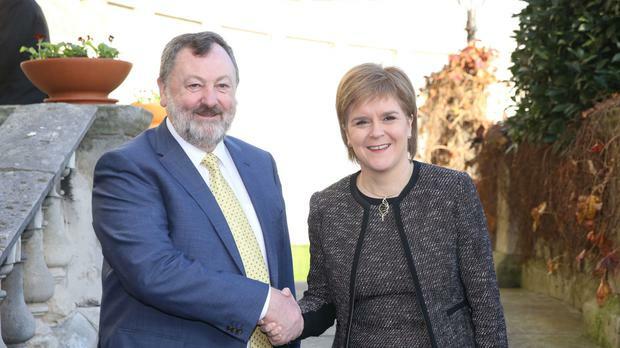 Scotland's First Minister Nicola Sturgeon has encouraged closer business ties between her country, the Republic and Northern Ireland during a visit to Dublin. She added that she passionately believes historic ties between Scotland and Ireland will be strengthened "to our mutual benefit in the years ahead", as sge backed calls for a "Celtic corridor" of closer business dealings. During a historic address to the Seanad, Ms Sturgeon said she will publish a blueprint on Scotland's Brexit options within weeks. She said the document, to be unveiled before the end of the year, will set out in detail ways in which the Scottish vote on the EU in/out referendum can be respected. "It will focus on options for Scotland within the UK. O f course, there is also the option of Scotland considering again the question of becoming an independent country. "That option remains firmly on the table." Ms Sturgeon, the first serving head of government to address the Seanad in Dublin, received a sustained standing ovation from the house after her speech. It was the culmination of a two-day visit to Dublin, which included talks with political and business leaders, aimed at strengthening ties between Scotland and Ireland in the wake of the June vote for Britain to pull out of the EU. Earlier, the First Minister met 130 business leaders at a breakfast gathering organised by the Irish Business and Employers Confederation. Ms Sturgeon also warned of a "hardening of opinion" against the UK by other EU countries. "I guess that's because the UK is still not being clear as to what it wants," she said. " In addition to that, other member states are hearing comments that suggest the UK can have its cake and eat it." Scotland voted to stay - by 62% to 38% - with every single council area backing the Remain camp. The SNP leader said how the UK responds to the referendum result will define Scotland for generations to come. "If the path that the UK takes turns out to be deeply damaging to Scotand's interests - to our economic, social, cultural and interactional interests - then the people of Scotland must have the right to choose a different future," she told senators. "We understand - acutely understand - none of what lies ahead is easy, but nothing about Brexit is going to be easy." Ms Sturgeon also warned Theresa May she has no mandate to pull the UK out of the European Single Market. One of Scotland's "guiding principles" on Brexit is that the UK must remain within the trading bloc as well as the EU Customs Union, she said. She is exploring options to "guard against the real possibility" that London plans to do otherwise. "I don't accept there is a mandate to take any part of the UK out of the European Single Market, especially when we consider the economic consequences of such a step," she said.